Located on the West Ridge right at SNOWSHOE, within walking distance to the Western Territory, this is a spacious home away from home. The large kitchen and den area are great for all your family or friends to gather. With high ceilings and a fireplace the den feels very roomy, and is adjacent to the kitchen which has a large dining table and an island kitchen bar so that you can spread out. The master bedroom is located on the first floor and has its own bath with jett tub. Three of the bedrooms share a bath with double sinks. The 4th bedroom is the bunk room with a queen/twin bunk and 2 futon couches that convert to queen beds with a large desk for working. This is a great room for the kids! The home has a huge front porch with breathtaking views of the valley, equipped with a swing for afternoon relaxation time. Darel and Lisa, with their 3 children, have loved coming to Showshoe for many years and hope you will love it as much as they do! Snowshoe Resort is a great place to bring your family. There are a few quaint shops in the village with restaurants and a coffee shop. The "Big Top" offers activities for the children all day. Outstanding view of the sunset! 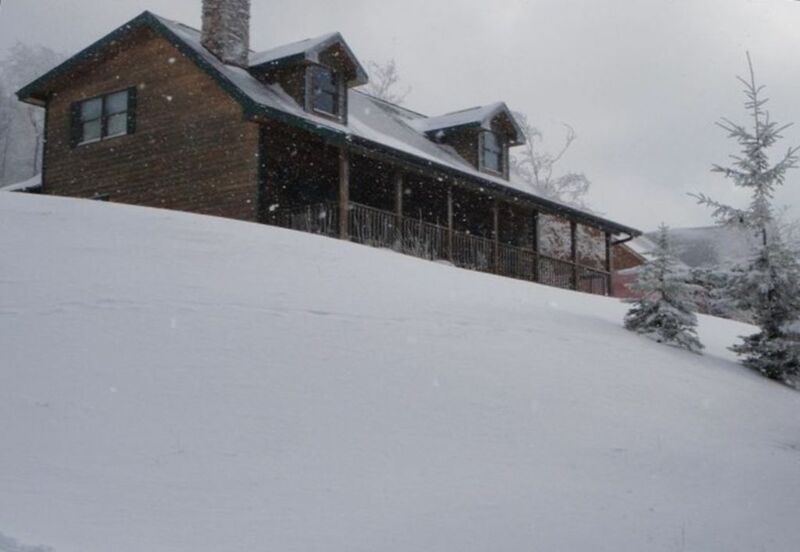 This is a terrific house really close to all the action of snowshoe. The layout and furnishings worked well for our group of 6 adults and 3 kids. The view is beautiful! The driveway is no joke if the weather is cold or wet. The house was not the best stocked with basics such as towels, hand soap in the bathrooms, tissues, etc. Overall a great time at a great place! Great location and comfortable cabin for two families with young children. Plenty for everyone to do! Loved watching the sunsets on the porch. The house was great, the pictures don’t do it justice. It had everything we needed. The shuttle was super easy and never took too long, about 15 mins max. The driveway was a little scary coming up in the snow the first night, but it was promptly scraped the next day. We will stay here again. Loved the hot tub and watching the deer. This was my first time staying outside of the village, and we enjoyed the peace and quiet and amazing views. Thanks for staying at our Snowshoe home. We are glad you and your family enjoyed your stay. We have had a complete remodel of the downstairs from top to bottom including furniture! This summer we are planing on putting in a parking area near bottom so that parking is easier. We hope that if you visit Snowshoe again you will keep us in mind! We stayed for a snowy ski weekend with three couples and our kiddos. Home is fantastic! Lots of room, warm fireplace, visiting deer, and a hot tub. Tons of fun and highly recommended. Be careful with the driveway! I am glad that your family enjoyed the stay! Our family loves out trips to Snowshoe. We hope that if you visit next year that you keep us in mind! We were two families (4 adults and 6 kids) staying at this beautiful home with breathtaking views and a short walk to the Western Territories slopes (0.4 miles, about 7 minutes walk). You can also call the shuttle to pick you up. It has a very well equipped kitchen and plenty of space for everyone. It was also fun to feed the deer with the dry corn provided with the house, our kids loved it! I am glad you and your family enjoyed your stay! We look forward to your stay at Snowshoe in the future. Thanks for booking with us again! Beautiful home with even better view! Great summer getaway from the humidity! Grocery store is limited on food items, you may want to bring your food items and toiletries from home.